The average class size for Pre-K through Grade 12 is 18 students. With a 10:1 student to faculty ratio in the high school, students receive the individualized attention and guidance necessary to prepare them for college and beyond. What is the Harkness Method? The Harkness method of teaching, pioneered and first introduced by Phillips Exeter Academy in 1927, is a collaborative learning approach where ideas are formulated, considered and debated by students with faculty guidance. At South Shore Christian Academy, we focus on rigorous academics and use the Harkness method for many high school English and humanities courses such as Comparative World Literature and Foundations of Western Civilization. Students are required to attain 23 credits for graduation. Credits are earned through courses in English, Math, Science, Bible, History, Foreign Language and Fine Arts. Does SSCA offer Advanced Placement classes? *Biology may be offered based on enrollment. 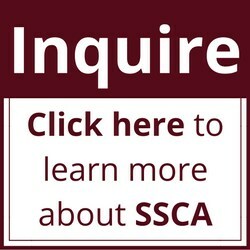 What sports does SSCA offer? The athletic program at SSCA offers opportunities to students in Pre-K through Grade 12 and helps fulfill our mission by developing student athletes on and off the playing field. Our athletics programs help to equip our student athletes with the necessary skills for a lifetime of healthy fitness and self-esteem as part of our overall mission to develop a strong Christian character. Lower school students in Pre-K through Grade 5 receive physical education instruction weekly. Students may compete in intramural basketball and soccer skills development clinics. Does SSCA have an Arts Program? Are entrance exams required for admission to SSCA? Applicants to Pre-Kindergarten and Kindergarten are required to complete a developmental screening test administered at SSCA. Applicants for Grades 1-5 are required to complete an entrance test administered by SSCA. Tests are administered following successful completion of the application. Applicants for Grades 6-12 are required to take a Secondary School Admissions Test (SSAT), an Independent School Entrance Exam (ISEE), or entrance testing conducted at SSCA. Financial Aid is available. SSCA utilizes the FACTS Grant & Aid Assessment program to process all tuition assistance applications. FACTS assists SSCA in assessing the financial need of the families applying for tuition assistance. Tuition assistance at SSCA is a need based financial aid program. It is available to assist students that could not otherwise attend SSCA without financial help. This assistance is available for parents or guardians of Kindergarten through Grade 12 students. Students are eligible to apply for financial assistance upon completion of the application process. Are there other costs that are not included in the tuition? Some costs not included in tuition include: registration fee, re-registration fee, uniforms, class trips, transportation, extended day programs, athletic fees, school pictures, Interterm and lunch. This list is not all-inclusive. Is a lunch program provided? A school lunch program is available through a local vendor. Order forms are available in the "Parent" section of our website. Drinks and snacks are also available for purchase. Is there an Aftercare program? SSCA offers Aftercare for students in grades Pre-K through Grade 5 whose parents cannot pick them up by 3:00 p.m. The hours are 3:00 p.m. to 6:00 p.m. and the cost is $8 per hour per student.